India’s largest state, Rajasthan, accounts for about 10 percent of the country’s land mass. 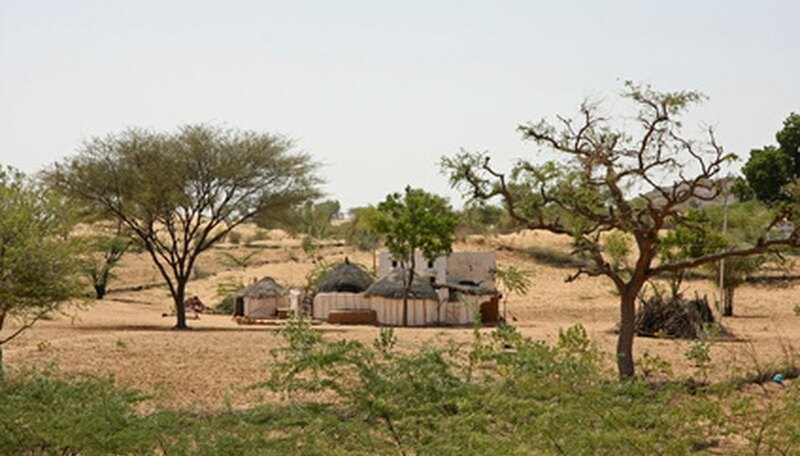 The inhospitable Thar Desert occupies northwestern Rajasthan where the growing conditions are punishing. The unrelenting sun scorches the landscape, limiting the scope of its vegetation. Very hardy trees are among the flora that can withstand the desert heat and provide a variety of benefits in various industries and for wildlife in the area. The reunjha tree (Acacia leucophloea) is indigenous to India and generally to south and southeast Asia. It has numerous common names, including white bark acacia, safed kikkar (Hindi) and safed babul (Bengali). This lofty and thorny tree with a broad crown shaped like an umbrella, can reach heights of around 114 feet, but its trunk is frequently crooked. As the name white bark acacia suggests, the bark of this tree is light, usually white to yellowish gray in its younger years. It turns black, rough and less thorny as it ages. Its foliage is feathery and its flowers are creamy yellow, blooming around July to November. Acacia leucophloea trees can live to 100 years of age. Although this tree is hardy and can survive in inhospitable conditions, the result is often a smaller tree or shrub. The white bark acacia provides shade and fodder for livestock. Besides India’s desert lands, this tree grows in Sri Lanka, Bangladesh, Indonesia, Thailand and Vietnam. The khejri tree (Prosopis cineraria) also commonly called jandi or ghaf, provided bark that made ground flour for food during the Rajputana famine of 1868 to 1869. The bark of this tree has multiple uses in the manufacture of boat frames as well as for the construction industry, and medicinally as a remedy for asthma, bronchitis, rheumatism, dysentery and muscle spasms. It is also a source of fodder. The tree’s fruit, however, is inedible. This smallish, thorny evergreen tree has slim branches with bluish-green leaves and yellow or cream colored flowers that bloom between March and May. It provides fodder for camels, goats and other animals. Prosopis cineraria grows to heights of around 20 feet, mostly at lower elevations, in India’s West Rajasthan, Punjab, Gujarat and Uttar Pradesh, as well as in Pakistan, Afghanistan, Iran and Arabia. The kanjho or Indian elm tree (Holoptelea integrifolia) is a member of the Urticaceae family, and also goes by numerous other local names. This large, deciduous tree is native to most parts of India. The bark of the tree is gray and scaly, with elliptic-ovate leaves and greenish yellow flowers that usually bloom in January and February. The tree bark has a number of medicinal applications for rheumatism, intestinal tumors, and pregnancy. Ringworm eczema and jaundice are two of the ailments for which the tree’s leaves provide solutions.